Defining your target audience is much easier said than done. Many writers end up skipping this step because they fail to recognize its importance in their book marketing plans. But the truth is, identifying and understanding the wants, needs and desires of your ideal readership can “make or break” your marketing strategy. Without a solid grasp of what makes your readers tick – and what they are really searching for – you will waste a considerable amount of time and energy promoting your work to an indifferent market. Or worse, you’ll begin to receive pushback or negative reviews from people that your book was never written for. There is a wealth of information at your fingertips, about every audience and sub-genre imaginable. From basic demographics like age, gender, location, income, occupation or ethnicity, to audience psychographics, like personality, attitudes, values, interests, hobbies, lifestyle and even behaviour. Bonus Download: Take action and download this FREE cheatsheet outlining the top 8 missteps – and how you can avoid them. Once you pinpoint the mistake(s) you’re making when it comes to identifying your target audience, you can revamp your marketing strategy to create content that sticks and helps you engage better with your growing community of readers. Plus, leave a comment below and let me know which mistake was your “Oh… oops!”, and what you plan to do differently to build a better, more meaningful connection with your ideal audience. You wouldn’t happen to have a transcript of the video (my audio is not working)? No transcript, but if you click on the title of the video (in the black bar at the top of the video), it will take you to view the video on YouTube. Below the video in the description section, you’ll find the main points listed. Thank you so much for this, Kimberly. This was informative, to the point and chock full of great tips. Very helpful indeed. One of my biggest mistakes is not thinking of my target market as one person, but an ambiguous demographic haze – that is kinda here and kinda there. Am glad I watched this – time to tune my marketing plan. Glad the video helped you, Tikiri! And yes, we often think of an audience as this mass of faceless “fans”, but in reality it’s this one interesting lady that you’d love to have a chat with over coffee. AND it’s this guy that you had a great conversation with while waiting for your bus. AND it’s this woman that you’ve known for awhile, but you just found out she enjoy’s the same hobby as you… And so on. Great advice about target marketing, Kim. I’m just beginning to work on platform building–quite in advance of publishing my novel-in-progress–so I am thinking of target marketing in terms of building followers on my fledgling blog (currently much in need of more targeted posts, planned but not yet executed, I’m sorry to say) and also other social network platforms. All this is new to me, so I’m a bit slow at it. My question to you: Where and how do you recommend doing the actual research on potential markets as one tries to clarify which groups are most suitable? For example, how can I research “20/30-somethings” who would find the relationship, sexuality, etc. issues my novel focuses on interesting, or perhaps be interested in late Sixties San Francisco and the Sexual Revolution, the hippies and lifestyles of the times, the very early stages of Women’s Lib? How do I learn about the demographics of groups? I’ve been trying, but the tangents I’ve followed haven’t seemed to lead anywhere fruitful. Congrats on getting a head start on your platform prior to publishing your book, Martta! You’re already many steps ahead of most authors. As for your question, I will be doing a 4-part video series on the topic of identifying your target audience – the first of which will address exactly this question. You couldn’t have chosen a better problem area to focus on, Kim. I was talking “audience” with a friend writer who’s put out five books in a sci-fi series, and he admitted he still wasn’t sure who he’s writing for. Or when I pose the question to other authors, they say “I write for anyone who enjoys a good book”. Well, that won’t do, and it’s hard to get this message across. I write romance and, of course, I want to sell books. Only after publishing my first novel did I fully understand that I want my reader to be younger in age if I want big volume sales. The readers that create viral books are the voracious “hot and steamy” romance readers who like their books short and lean, to-the-point, usually written in deep PoV so that they can relate to the protagonists quicker and deeper. I’m now in the process of editing my book to come closer to those standards. Wish I’d known before, but better late than never. Thanks for your feedback MM. Yes, it’s a slippery concept for writers. It’s a big enough struggle to get someone to notice or buy your book in the first place, so suggesting that they narrow their focus and actively remove people from their list… Yikes! But the better you understand the “right” audience for your work – those who will benefit most from your book – the easier it is to find more of these like-minded individuals. It sounds like you’ve got a pretty good handle on your ideal reader. Are you finding that this “insider information” is helping you with both the writing AND the marketing of your book? Thanks, Kimberley! Very informative! Question: where is the “like” button? Glad you found it helpful Juliana! Thank you for this video. It helps to know that I am not the only one preaching ‘understanding the market’ to authors and writers. Unfortunately for us in the Caribbean, most people ‘write’ to satisfy the general market and are just happy to ‘get the book published’ there is seldom any thought about the market and what can be done by segmenting and targeting. Let’s spread the word Cecly Ann! Awesome John! And more to come on this topic to help you take action. Kim, your video rings true! As a book designer, I see this happen all the time. Especially #5, then #6. 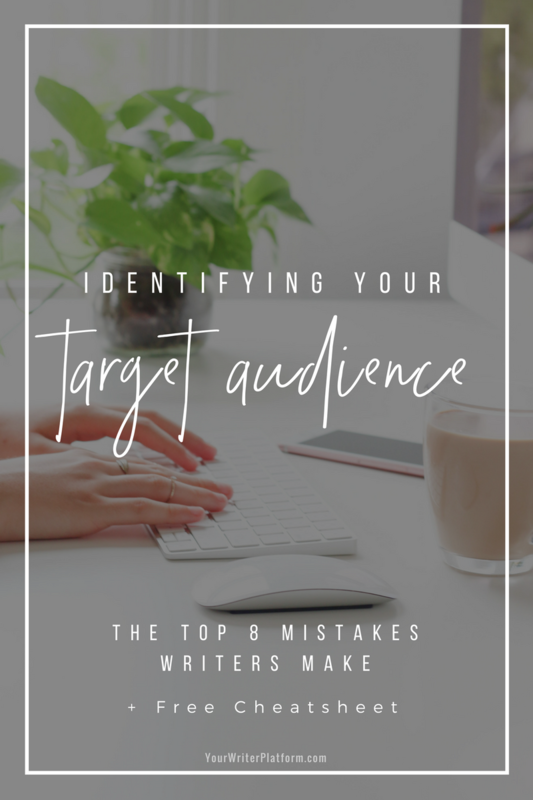 When I meet with an author, I always ask “who is your target audience?” Most authors reply with a broad / generic answer, especially first-time authors. I will share this article with my clients. thanks! So true Peggy. Many first time authors struggle with this, in part because they’re still unsure themselves as to what they’re really trying to say. It takes time to really nail it down. Creating an author brand is tricky, developing content is difficult, and of course marketing becomes downright painful if you can’t articulate what you have to offer, and the ideal group that you hope to offer it to. Thanks for this post and video. I’m beginning to realise that I’ll have to tweak my marketing plan. I had begun building an author platform before publishing my first novel but I see now my initial attempts were too general. I was trying to be too many things at once, to too many people. I see the need to narrow down my focus and identify exactly the type of person who could be attracted to reading my book. That way I can build more meaningful relationships with people. I’m going to share this as I know of some other authors in a similar position to me who’ll find it useful. Yes Mark, it’s difficult at first to hone in on exactly who it is you’re trying to have your work connect with, but it will be worth the effort. Best of luck, and thanks for sharing the video!